I have been noticing that a lot of our fellow engineers have either appeared for CDAC CCAT OR are preparing to take the exam in near future. One of the main reasons several engineers opt for CDAC course is because they are unable to find good placements after completion of their graduation. However, is placement guaranteed after completing CDAC course? Should you really invest time and money into preparing for CDAC? What are the courses that are hot in the markets and have higher chances of getting students placed? I think someone needs to answer all these questions. I checked several websites for reviews of CDAC centres and their placement records in general; and have found out very mixed reviews. While the popular centers remain Hyderabad, Bangalore, Pune, Mumbai and Noida it seems that students have had very mixed experiences in each of them. I've personally known many people who've benefitted from various CDAC courses and found placements in MNCs; but that was at least about 10 years ago. I'd like current and past students of CDAC to come forward and share their experiences, honest reviews and opinions about various courses and centers. It'd help a lot of our fellow engineers. sir i got 1657 rank in c cat. I have filled my choices as shown. Please guide me. Thanks in advance. Guys, this discussion is about some other topic. Please stick to the topic. i am 2015 ece pass out student. i want to know which course between pg-dac our pg-desd will be best for me in terms of cdac placement and also in future growth of mine. Sir, My rank is 2045,Is it good to do PG BDBA from know It cdac campus of pune? And what are their tutorial and Placement status? Need urgent help, I am a 2013 passout with 69% throughout my academics, i have work experience in IT of 3 Years. 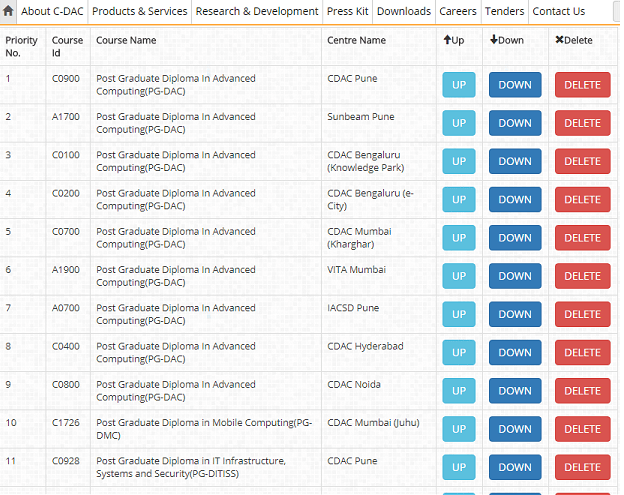 what are my chances of placement if i go for PG DAC from Pune now. @Admin :- Please share your valuable feedback. @Admin :- I have posted thrice on the crazy engineers forums and has never got any response on any questions. Someone suggested that this is a good forum but i think he is wrong. Sunbeam institute in Pune seems to have good reputation. However, it'd be better to have opinions from ex-students of Sunbeam and what they think about overall quality of education at Sunbeam. 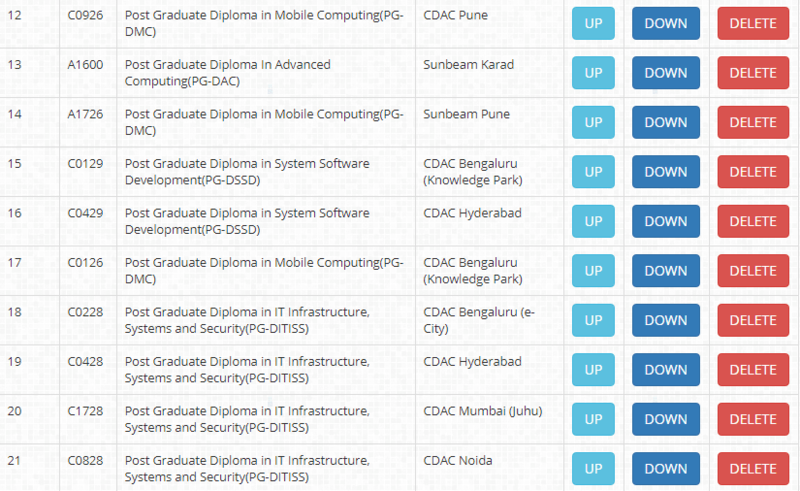 I got c-dac juhu for pgdac course. How is the placement record of c-dac juhu? Any chances to get c-dac kharghar in 2nd round at rank A+B=2639?? Sir my ccat rank is 3000 which cdac centre is better in Mumbai?? @Manish Bhandare - have you checked existing discussions on the topic? DON'T JOIN CDAC JUHU AND CDAC KHARHGAR from Mumbai they are Poor in teaching and placement. My suggestion DON'T JOIN CDAC JUHU AND CDAC KHARHGAR from Mumbai. They are fooling students to make moneY. They try to ruin my life. CDAC MUMBAI is Poor in teaching and placement. Now a days Placement is Very low in CDAC Mumbai. CDAC JUHU AND CDAC KHARHGAR FROM MUMBAI EVEN FAIL STUDENTS FOR NOT GIVING PLACEMENT. Many Students are not getting placement. CDAC JUHU AND CDAC KHARHGAR from Mumbai are fooling students only to make money. Fees collected from Students goes in the form of salary to CDAC staff. My suggestion DON'T JOIN CDAC JUHU AND CDAC KHARHGAR from Mumbai. Placement Percentage is Very poor. DON'T waste your parents money on CDAC. CDAC Certificate has no value in market. even teaching is not good from CDAC MUMBAI. So don't join CDAC and waste your parents money. CDAC MUMBAI is Fooling students to make money. CDAC JUHU AND CDAC KHARHGAR FROM MUMBAI IS VERY POOR IN TEACHING AND POOR IN PLACEMENT. CDAC MUMBAI JUHU AND CDAC KHARHGAR are looting money FROM students to pay staff salary. Do you guys really got any job doing CDAC courses? Please tell me honestly? CDAC JUHU AND CDAC KHARHGAR from Mumbai Don't guarantee for placement. CDAC JUHU AND CDAC KHARHGAR FROM MUMBAI ARE POOR IN TEACHING AND POOR IN PLACEMENT. DON'T Waste your parents money on CDAC Mumbai.